Red Lion Controls announced that their Crimson 3.0 software platform is now compatible with Banner Engineering's iVu Plus TG vision sensors. The iVu driver joins a list of over 200 serial and Ethernet communications drivers included in the programming software. 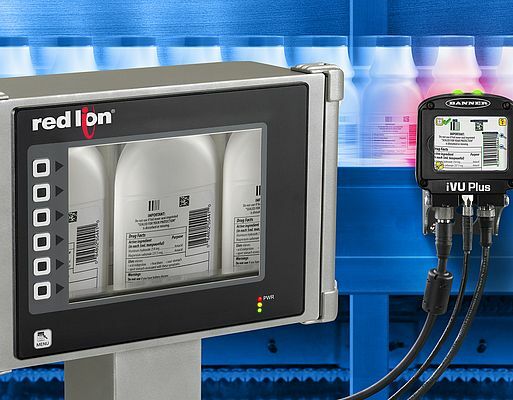 With the iVu Plus TG support, the users are able to display vision sensor operation and perform commissioning and operation via the company’s G3 Series HMIs, Modular Controller or Data Station Plus. Utilizing the intuitive touchscreen interface featured on G3 Series 8", 10" and 15" HMIs provides users with the ability to visualize image outputs and direct iVu Plus TG operation remotely. Additionally, for enhanced data visibility and accessibility, interfacing iVu Plus sensors with HMIs and other management tools enables users to apply the built-in, data-logging capabilities inherent in the company products to inspection applications. Users can record and export data from the iVu Plus, storing it in an IT-friendly, CSV file format, so data can be viewed easily through universal desktop programs, such as Microsoft Excel.